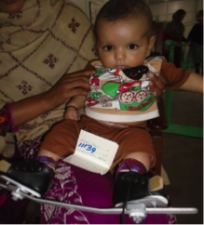 Around the world, 150,000 – 200,000 babies with clubfoot are born each year. With generally accepted incidences (1-3:1000), the estimated load of clubfoot in Azad Jammu and Kashmir (AJK), where 0.11 million births occur every year is approximately 250-500 new cases each year. 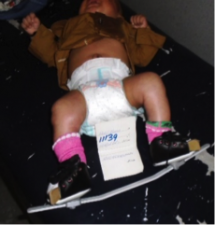 Without treatment, the clubfoot deformity causes a lifelong impairment. Use of the minimally invasive Ponseti method is emerging fast in low and middle-income countries, where most of the world's children with clubfoot are born. Untreated children with clubfoot find it difficult to access education, employment and experience exclusion from society. 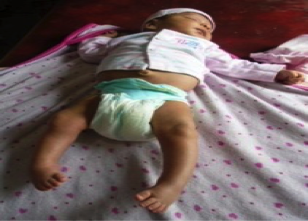 AH is 5 months old and has idiopathic bilateral clubfoot. He was referred by child specialist to Muzaffarabad Physical Rehabilitation Centre (MPRC) which is run by Department of Health AJK and International Committee of the Red Cross (ICRC). AH has all the elements of Cavus, Adductus, Varus and Equinus present bilaterally. He has no any other abnormalities. To present treatment response in a child with idiopathic bilateral clubfoot with the Ponseti method. After detailed assessment and proper counselling, Ponseti Serial Casting was started. Six serial casts were applied to correct, the cavus, adductus and varus deformities and every week the Pirani Scoring was recorded. A Percutaneous Heel-cord Tenotomy was performed to correct the equinus, followed by 3 weeks long cast. This correction was maintained in Foot Abduction Brace (FAB) initially 23 hours a day for 3 months and followed by night splinting, which will continue for approximately 3 years. The parents were taught range of motion exercises on removal of the splints. His family provided written consent to present his case. The deformities of AH were corrected after seven serial casts. The midfoot and forefoot were corrected to Pirani 0 in both feet after six casts. His Hindfoot Pirani Score was also recorded as 0 after the removal of a three-week casting after his Achilles Tenotomy. AH is wearing a Foot Abduction Brace for the last three months and will continue with the brace for three more years. From the last three months, AH currently shows no signs of relapse. The outcome was measured by Pirani Scoring.